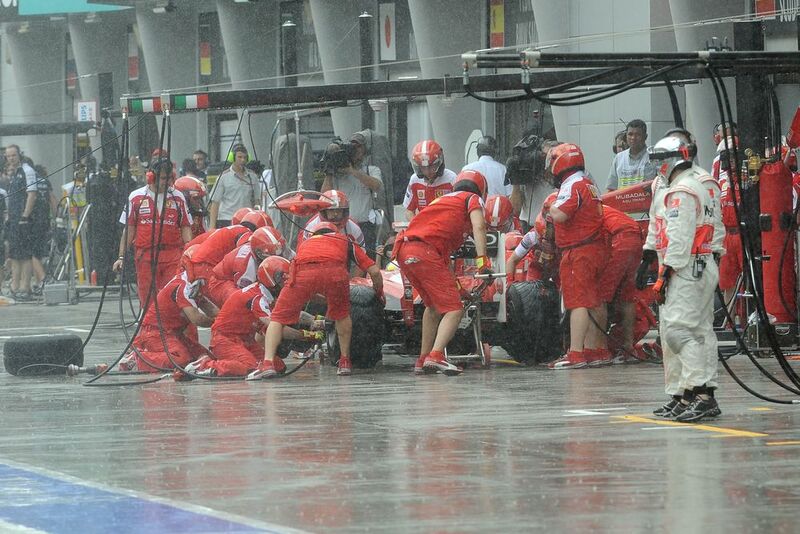 Everyone loves a wet race or a wet qualifying session, right? 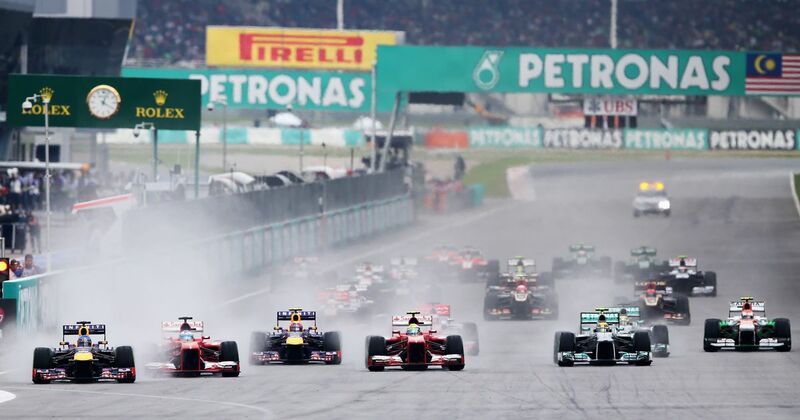 Though there are some races where we hardly ever see rain, the Malaysian GP wasn’t one of them. In fact, the only thing about the weather there that was predictable is that it was unpredictable. Whether it’s a light sprinkling or a sudden downpour, rain gave us plenty of great moments at the Sepang International Circuit. Here are six of the most memorable. Olivier Panis suffered a monster engine failure at Turn 6 on the second lap of the 2001 race, dumping oil all over the track. To make things a little bit more challenging for the drivers, it had also started to chuck it down. The combination of oil and water made the surface treacherous and several cars - including, dramatically, the two Ferraris out in the lead - found themselves skating off the circuit as the amount of standing water reached ridiculous levels. Drivers were spinning off everywhere and the safety car had to come out for a few laps. Thankfully the rain disappeared just as quickly as it had arrived and racing got underway again pretty quickly. You’d expect the chaos to have really shaken things up, but Ferrari being Ferrari managed to quickly find itself at the front again, thanks to the awesome Bridgestone intermediate tyres and, possibly, the less-awesome rumours of illegal traction control. 2009 - Felipe, baby, stay cool! The 2009 race was an absolute classic. When a massive thunderstorm brought the race to a halt on lap 33 the drivers began to line up on the grid, and a pumped-up Felipe Massa was pretty keen to make sure he had the right visor for when the race restarted (which, of course, it wouldn’t). His demand for a white visor was met with a comedic soothing response from Rob Smedley - just one of the many moments of their incredible bromance. Keen not to be outdone by his teammate during the red flag period, Kimi Raikkonen pulled a classic Kimi move when he was spotted not wearing his racing gear and casually chowing down on an ice cream. Some used it as an excuse to lay into the Ice(cream)man about his apparent lack of commitment, but it turned out his car had broken anyway so he couldn’t have hoped to rejoin the race. And hey, it turned out to be a good move, because it’s become a legendary moment. Keen to save tyres in Q1, in 2010 Ferrari and McLaren elected not to go out on track at the start of the session and set a time. Pretty much everyone else did though, because rain was in the air and they didn’t want to get caught out. By the time the Ferraris and McLarens emerged onto the circuit, it was too late. The track was too moist and only Jenson Button managed to scrape through to the next part of qualifying - but he then he spun before the end of Q1, so couldn’t take part anyway. To add even more embarrassment, the new teams of Lotus and Virgin managed to squeeze through to Q2, thanks to the efforts of Heikki Kovalainen and Timo Glock. And all because of something as simple as, you know, knowing exactly when it was raining and not relying on radar to tell them. Fernando Alonso put on a masterclass to win the 2012 race, taking his uncompetitive Ferrari into the lead in the wet early stages. But it wasn’t a challenge from the likes of Sebastian Vettel or Lewis Hamilton he had to fend off, it was from the Sauber of Sergio Perez. Perez did a sterling job on a wet track to work his way up into second, but as it dried out he didn’t drop back - oh no. He actually started to reel in Alonso, closing right up behind the Ferrari as the two made their final pit stops for slick tyres. Perez lost ground but started to catch up again, and for a while it looked as though he was actually going to win the race. But a few laps from the end a small error at Turn 14 dropped him further back, and he had to settle for second. Still, it had been a mega performance. When rain fell shortly before the start of the 2013 race Alonso became an immediate favourite, especially given what he’d done at the track the previous year. 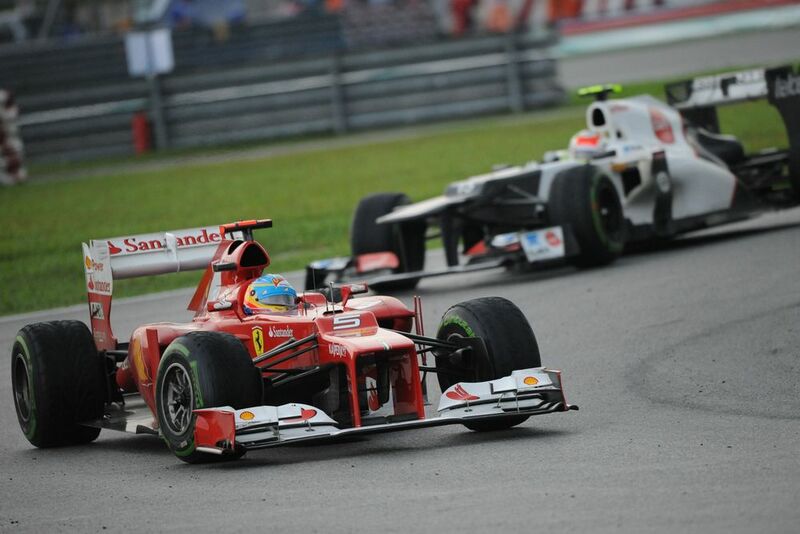 His hopes were dented however when he nudged the back of Vettel’s car in Turn 2, damaging the front wing. No big deal though, right? He could come in and get it fixed at the end of the first lap and probably recover to a decent position. That would probably have been the case, but Alonso was still running reasonably competitively and so he went into full Gilles Villeneuve mode, deciding to stay out and wait until the track was also ready for slicks so he could change the nose at the same time. It proved to be the wrong move as heading into turn one at the start of lap two his wing came completely loose, wedged itself under the front wheels and sent him into the gravel, and out of the race.